Take a mixi jar grind coconut and cardamom.Do not add any water. Now add the chopped dates and pulse it.Your mixture will look like a thick paste. 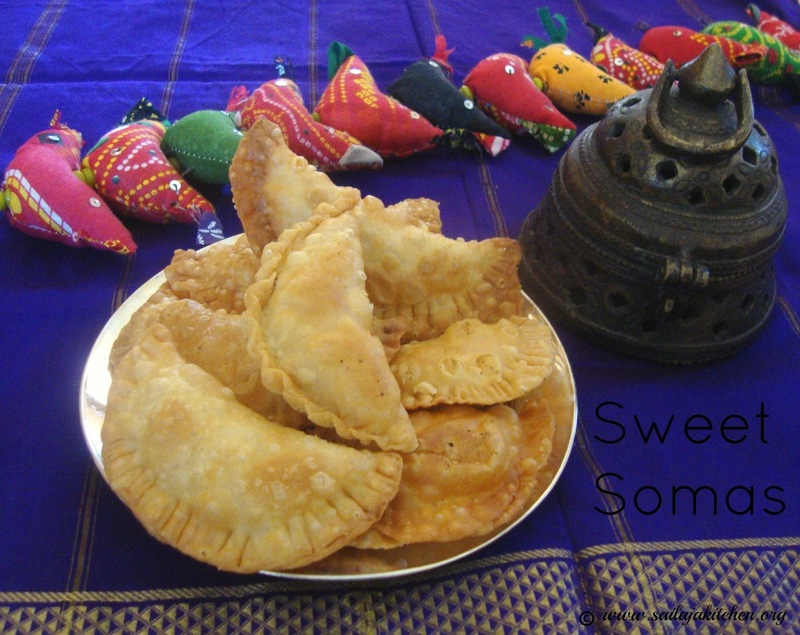 Remove it in a bowl and add the jaggery powder and poppy seeds. Mix well grease your palm and divide it into 8 equal size balls. Mix all above ingredients together,knead it to a soft dough.Keep it covered for 30 minutes. Divide the dough mixture into eight equal balls. 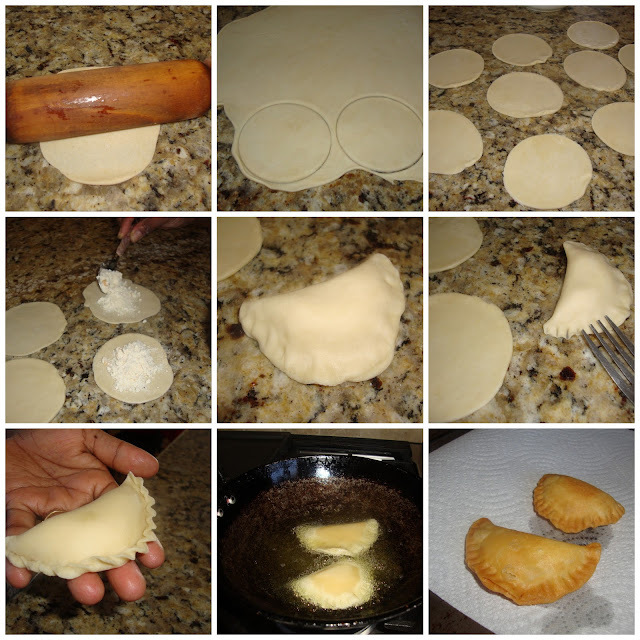 Grease a plastic sheet or zip lock cover,apply some ghee or oil.Spread the outer covering dough like a small disc,place a ball of filling mixture in the middle. Close it well & seal it to make sure your filling doesn't come out.Place another plastic sheet on top,roll it out into a semi thick disc. Heat a tawa & cook them with little ghee or oil spread on both sides and cook till its light brown on all sides. 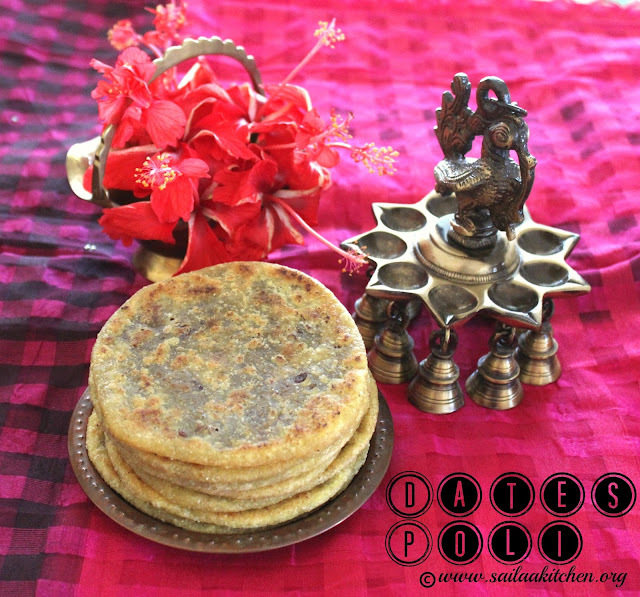 a) Do not compromise on ghee,otherwise the poli will become hard & dry. 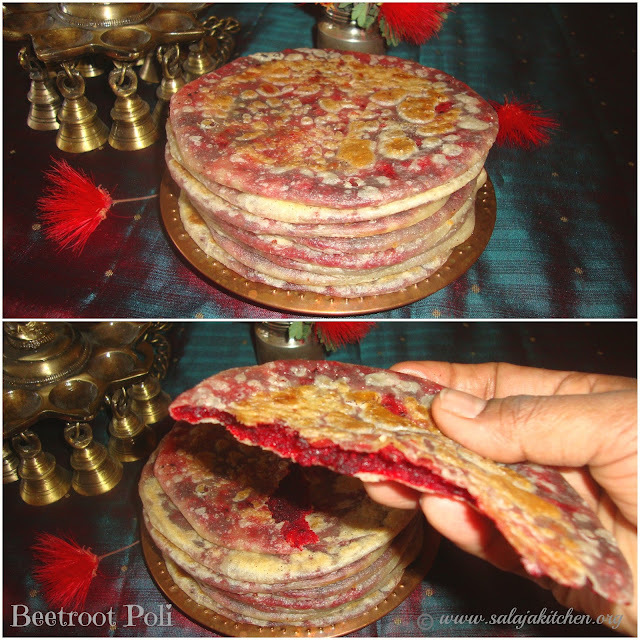 b) Make sure your filling/poornam is dry,otherwise it will come out while making poli. c) Just before serving heat slightly,smear some ghee on top & serve. d) Only ghee can also be used for frying the poli. e) While grinding your mixture is water then just take a non stick pan and cook the mixture to thicken.Cool and make balls. f) You can use only maida to make this poli,for healthy version you can make it with wheat flour. Pour milk in a heavy bottom pan boil till it slightly reduces. Add sugar and boil for couple more minutes. Switch off the stove add the saffron,nuts and cardamom powder. Mix and keep it in the refrigerator. Remove the crust and cut the bread slices using a round big cookie cutter arrange these on a plate. Just before serving pour the cold milk mixture on top of the bread sprinkle some nuts on top and enjoy! a) Always serve this sweet cold make sure your milk mixture is cold when serving. 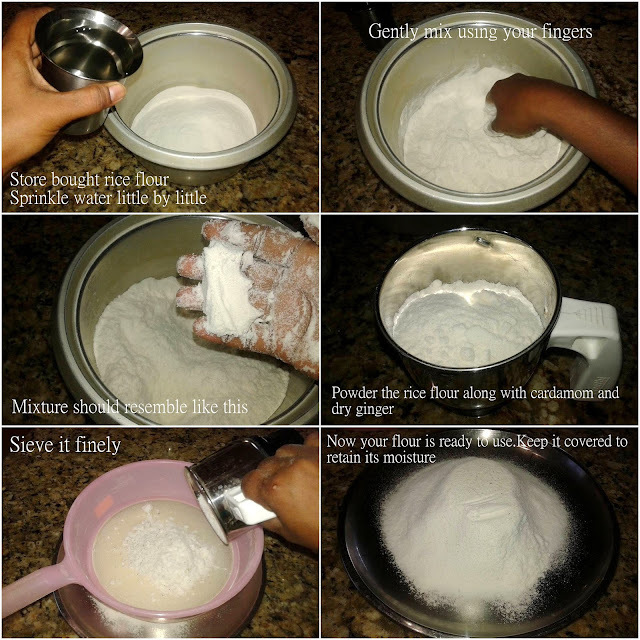 b) Do not soak bread in milk pour the milk just before serving. c) You can add almond flour to thicken your milk quickly. 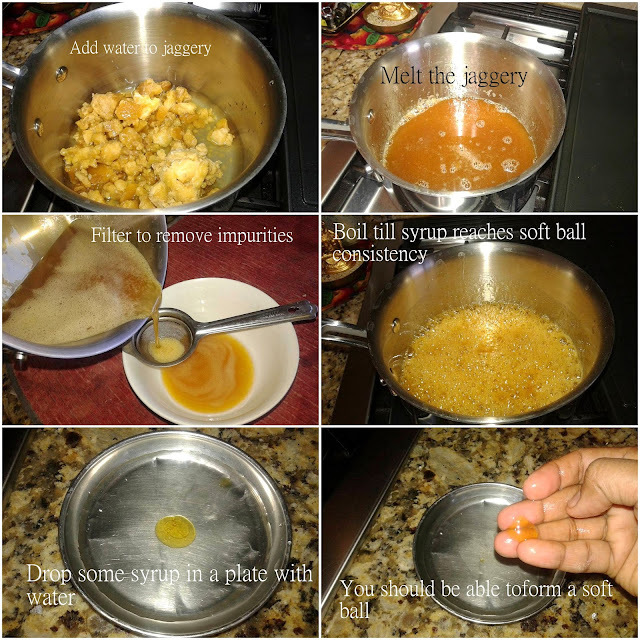 Put all above mentioned ingredients together in a wide bowl except warm ghee,mix it well. Now pour warm ghee little by little & roll it out into small tight balls. Store it in an airtight container and enjoy! a) Store bought urad dal can be used but make sure you have dry roasted till raw smell has disappered. Finely grate the beetroot or pulse it in mixi.Do not add water while grinding. Add desiccated coconut,almonds & cardamom in a blender & make a fine powder. Heat ghee in a pan add the grated beetroot & in medium high flame fry till raw smell has completely disappeared & cooked. Now add the desiccated coconut/almond powder & give a quick mix. Add the sugar & 1 tsp of ghee & fry till the mixture is dry & well combined. Switch off the stove cool the mixture & divide into 10 equal size balls. 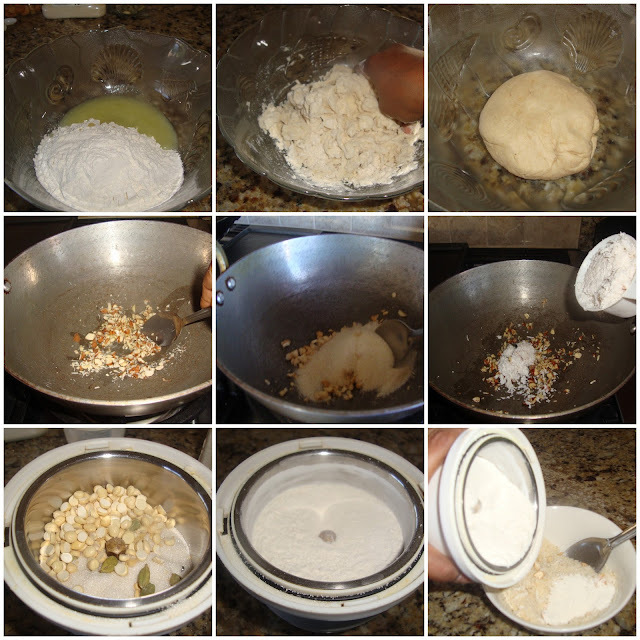 Take a bowl add maida,sooji,oil,salt mix to resemble bread crumbs. Now slowly add water little by little till you form a soft dough. Cover & rest it for 10 minutes.Divide the dough to 10 equal size balls. Grease a plastic sheet place the covering ball on top flatten it slightly,place a filling ball on top & cover it.Make sure its sealed well. Apply oil to your fingers and evenly flatten it to a thin disc.You can also use a rolling pin to roll it.Make sure the stuffing doesn't come out. Heat a tawa cook the poli with ghee till slight brown on both sides. Take the store bought rice flour in a bowl,sprinkle water little by little. Using your fingers mix the rice flour till it resembles like bread crumbs..When you press the flour it should hold the shape ( see picture). If you break the flour they should crumble easily.Then your flour is in right consistency. Take a mixi jar add the cardamom ,dry ginger and rice flour.Powder them finely and then sieve it well to get a smooth powder. Your rice flour is ready to use.Always keep the flour covered to retain its moisture content..
Take a pan add jaggery and water boil till jaggery has dissolved. Now filter the syrup to remove any impurities. Bring this syrup to a nice boil,keep a small plate pour some water water in it. Pour a drop of syrup into the water if you are able to form a soft ball ( see picture) then the consistency is right. 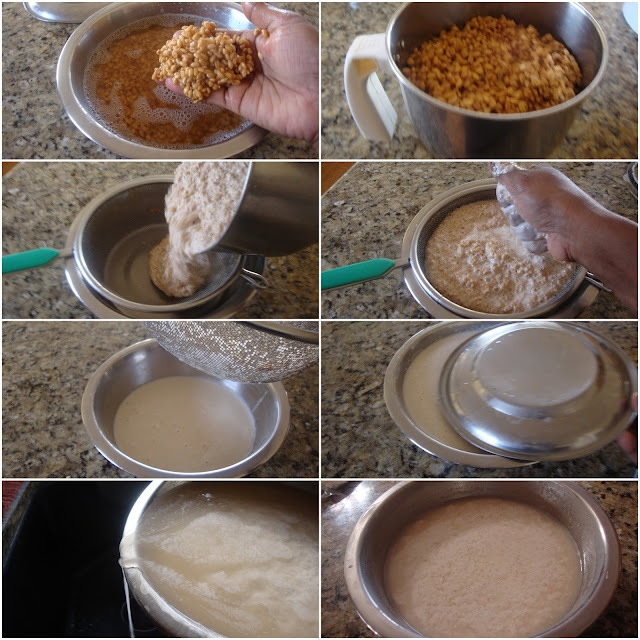 Switch off the stove and pour the syrup into the rice flour,keep mixing till it forms to a soft slightly flowing consistency.If you still have some left over syrup save it for some other recipe do not add all the syrup. Cover this mixture in a closed container and keep it at room temperature overnight. 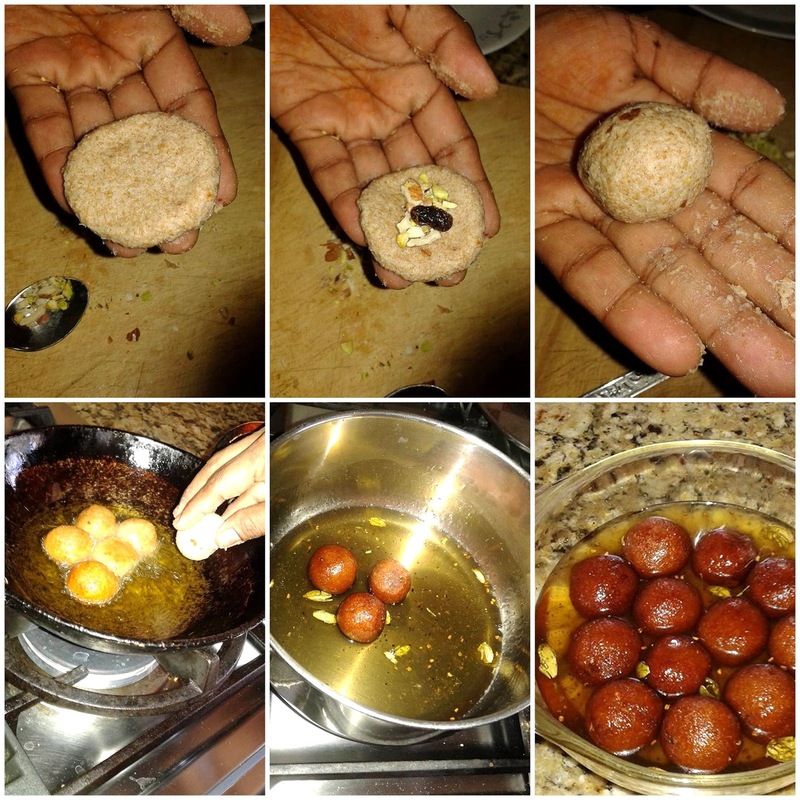 Next day divide the dough into small balls,grease a sheet with ghee and press these balls to a flat semi thick disc. Heat oil in a pan & in medium high flame fry these adhirasam both sides till light golden brown. Remove it from oil & press it by keeping it in between 2 ladles to remove excess oil. Store it in a air tight container and enjoy! 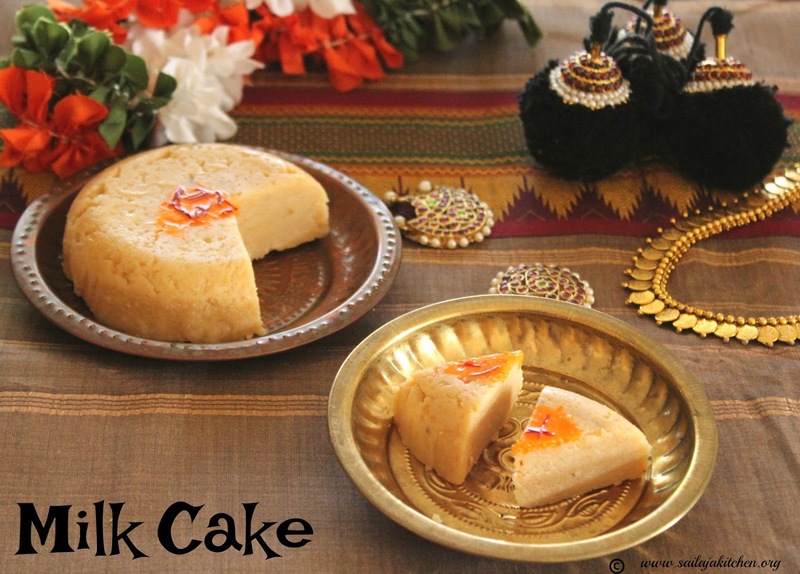 a)Add jaggery liquid little by little,the consumption of jaggery depends upon the quality of rice. b) Poppy seeds or sesame seeds can be added to the flour for extra taste. c) Do not flatten the adhirasam very thin,otherwise while frying it becomes crisp or will break. d)Flip immediately once it rises in oil.Do not deep fry till dark brown,otherwise your adhirasam will become hard. 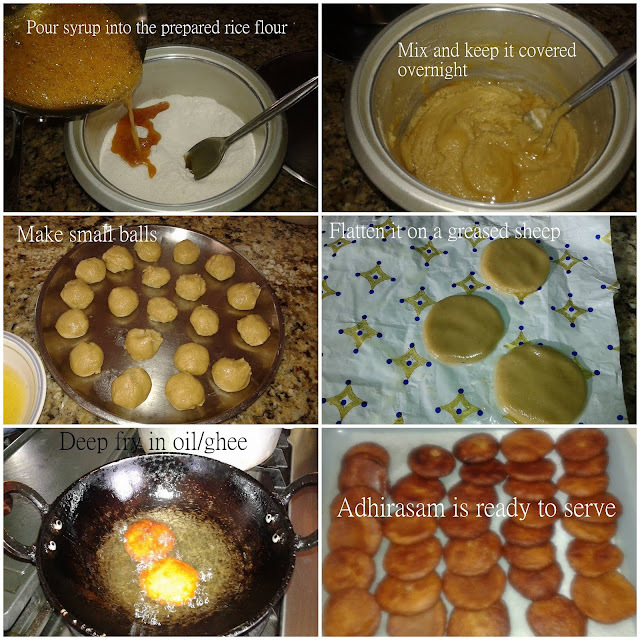 Click HERE for traditional method of making Adhirasam. Dry roast all the nuts separately till its slightly warm,do not burn the nuts.Cool and dry grind to a fine powder,keep it aside. Dissolve sugar in water,bring it to a boil.Once you have got the 1 string consistency add the powdered nuts. Reduce the flame and mix it well.Once it starts to thicken slowly add the ghee.Mix till the mixtures leaves the sides of the pan,pour it into a greased tray. While still warm cut into desired shapes & enjoy!!!!! a) Use any combination of nuts of your choice. Pour milk & cook till it has evaporated. Now add the sugar,food colour,khoya,cardamom powder & fried nuts,mix it well till the ghee separates the pan. Garnish with saffron strings & serve the halwa warm. Heat a non stick pan add the sugar and 1/2 cup of water let the sugar dissolve. Keep stirring till its 2 string consistency, this will not take much time. Now pour the ground paste reduce the flame and keep cooking till the mixture has become thick.the consistency will look like a thicker batter than a dosa batter.Do not add ghee till you reach this stage. ( this will take some time and be careful about the splash). At this stage start adding the oil/ghee and keep mixing till the mixture leaves the sides of the pan and has completely absorbed the ghee. Immediately pour it on a greased tray and cut it into desired shapes while still warm. Pour milk in a heavy bottomed pan,in medium low flame boil the milk stirring in between to avoid burning at the bottom.This will take more than one hour. When the milk has reduced and thickened add the lemon juice. Once the juice is added do not mix leave it to boil for couple minutes. Now stir for the milk to curdle and has a grainy texture,add the sugar and stir till all the water has evaporated and colour has changed to light brown. Mix in the cardamom powder and cook it for couple more minutes. Grease a container or tray with ghee and pour the mixture into it.Spread the mixture evenly. After 24 hours cut and serve. Grease a pan with little ghee and keep it ready. Mix the ricotta cheese & condensed milk in a microwave safe bowl,mix it well.Make sure there are no lumps. Microwave for 10 minutes uncovered. Mix in intervals between every 2 minutes. Just 30 seconds before the end add the saffron & crushed cardamom powder. Meanwhile take the chocolate morsels,butter and milk in a microwave safe bowl.Microwave for 1 minutes or till the chocolate has melted. 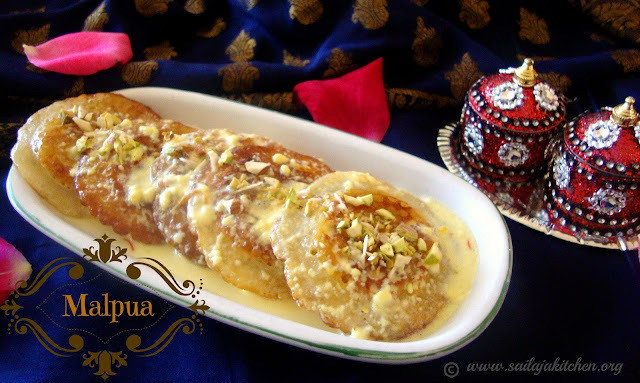 Mix it well now pour it on top of the kalakand and sprinkle the chopped nuts. Keep it in fridge for 2 hours and cut it with a sharp knife. a) Each microwave is different so the cooking time can vary. b) When ready to cut into pieces dip your knife in hot water and then cut for crack free neat pieces. Take a pan add sugar & water bring it to a boil. Once the sugar has dissolved add crushed saffron,do not boil the sugar syrup. Once its sticky switch off the flame,do not wait for any string consistency. Add rose essence mix & keep it aside. Take a bowl add all the ingredients under batter. Pour milk little by little till its smooth like pancake batter. Heat oil in a pan pour a ladle of batter,shallow fry till both sides are cooked & light brown. Remove & immediately dip it inside the warm sugar syrup. Make sure both sides are well coated. Remove it on a plate pour some rabdi on top sprinkle nuts & serve cold or warm. Pour water little by little and make a thick pouring batter consistency. Heat a tawa grease it pour a ladle of batter and spread it,pour ghee around the dosa. Cover it with a lid and cook till done. Flip it other side and cook for a minute and remove. a) As the jaggery was clean i added it directly.Otherwise please dissolve it in water filter and then use to remove all impurities. b) If you don't want to cook in ghee then add half ghee and half oil. c) These dosa are eaten hot. Take a pressure cooker dry roast moong dal till light brown,do not burn them. Pour water and pressure cook till soft.Cool and open the cooker mash it well to get a smooth paste. Heat a non stick pan add 1/2 cup ghee and wheat flour roast till raw smell has disappeared.This step is very important otherwise your final dish will have a raw taste and smell. Now add the mashed dal,sugar and food colour in medium low flame start cooking the mixture. When it has started to thicken slowly add remaining ghee little by little and mix till the halwa has started to leave the sides of the pan. Switch off the stove add the fried cashew nut and cardamom powder mix well. 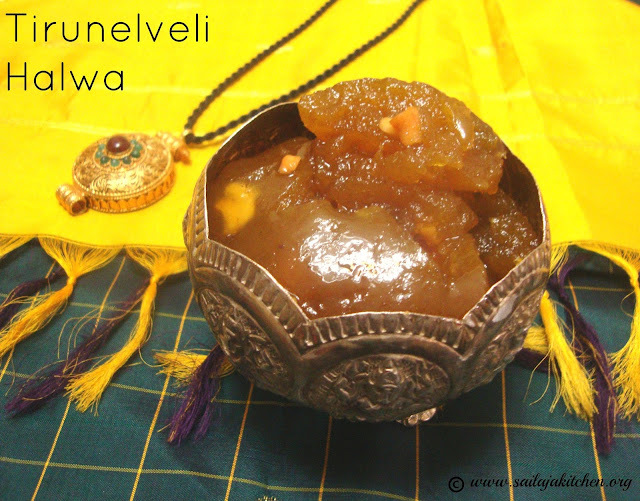 Serve this halwa hot or warm. Soak the whole wheat in water for 8 hours or overnight,next day wash it well. Pour fresh water & grind it in a blender or wet grinder till soft. Extract the milk add some more water & repeat the process 2 more times. Now cover this milk & leave it for 6 hours.After 6 hours you will find the thick milk settled at the bottom & clear liquid on top. Now slowly discard the clear liquid making sure the thick milk is not disturbed. Now add 1 & 1/2 cups of water to the thick milk mix & keep aside. Take a non stick pan add 1 tbsp of sugar & 1 tsp ghee keep mixing till sugar melts. Continue stirring till the sugar has caramelized, now reduce the flame and add the remaining sugar & 1/2 cup water. Boil till you get a one string consistency now add the diluted wheat milk . 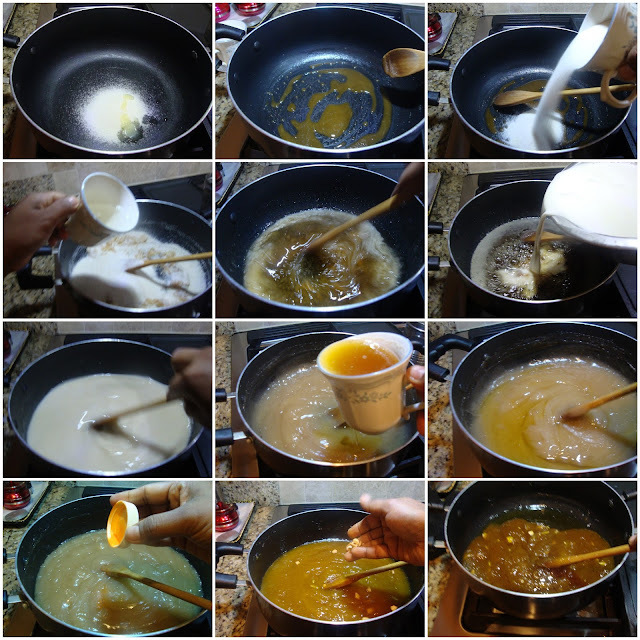 In medium low flame keep stirring till raw smell has disappeared and the mixture has started to thicken.Now add ghee in intervals and keep stirring till the whole halwa has absorbed the ghee. The last stage is the whole ghee will ooze out from the halwa & the halwa just slides out from your ladle.At this stage add the fried cashew nuts & cardamom powder. Mix well & switch off the stove.Serve them warm! 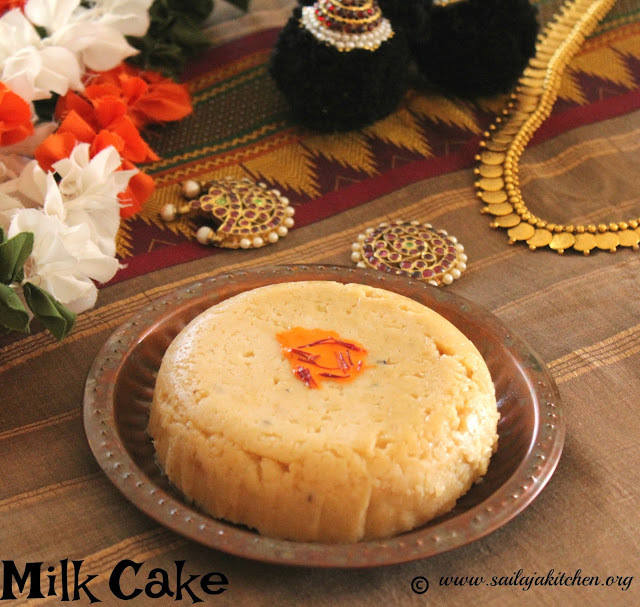 a) The ratio of this sweet is usually wheat milk - 1 cup,sugar -2 cups ghee -1 cup. b) Cook the mixture till raw smell has completely disappeared before adding ghee otherwise the finished product will have a raw smell ( very important step ). 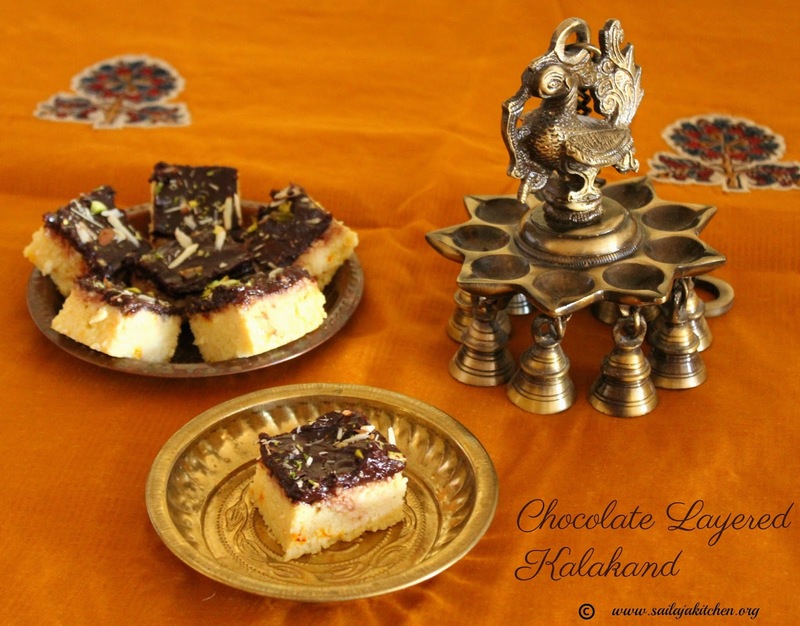 c) Non stick pan is better for this sweet, its easy to clean & stir.I have made this halwa even in slow cooker but i liked the texture only on stove top method. d) Warm the halwa before you serve. Powder sugar,cardamom and fried gram dal to a fine powder. Heat ghee in a pan roast cashew nut & rava till light brown,switch off the stove add the coconut immediately & mix it well. Cool the mixture & add the powdered ingredients,mix well till everything is well combined.Keep it aside. Take a bowl add ghee and maida mix till it resembles bread crumbs. Now slowly sprinkle water little by little to for a soft dough. Cover & rest it for 5 minutes.Roll out the dough into a thin sheet. Use a circle cutter to cut into small disc.Place 2 tsp of filling in the middle. Clove it into half & seal it well by pressing with a fork or pleat to form a pattern. Cover these somas with a cloth to prevent from drying. Heat oil in a pan and deep fry in batches in medium low flame till crisp & light brown on all sides.Remove it on a kitchen paper,cool & store it in a dry air tight container. a) Fry the somas in medium low flame otherwise after sometime your somas will become soft. b) Use any filling of your choice. c) Sealing is very important otherwise the somas will open up and filling will come out. Pressure cook the Channa Dal with 3 cups of water till done.Remove some whole Channa Dal separately & mash the remaining dal. Dilute jaggery in 1 cup of water,filter it to remove any impurities.Pour this melted jaggery into the dal & in low flame cook for 5 minutes. Heat ghee in a pan fry the coconut bits till brown & keep it aside.In the same pan fry the cashew nut & raisins till light brown. Add coconut milk to the cooked dal mixture, before it boil switch off the flame.Now add the saved Channa Dal,fried coconut bits,cashew nut & raisins,mix & serve it hot or warm. a) Do not reheat the payasam as we have added coconut it may curdle. Wash and soak dal & rice together for 2 hours. Drain the water and grind it with a pinch of salt to a smooth thick batter. Heat oil in a pan drop small balls with a spoon & fry them till light brown on all sides.Do not fry till they are crisp.Then they may not soak well in the milk. Remove on a kitchen towel keep it aside. Boil the whole milk and let it cool.Take a bowl add the milk,coconut milk,sugar and cardamom powder.Mix till sugar has completely dissolved. Now add the warm fried paniyarams & leave it to soak for 20 minutes. Garnish with saffron strands and serve them cold or warm. a) Grind the dal in wet grinder for a smooth thick batter. b) Add sugar according to your taste. c) Fresh coconut milk always gives a better taste. 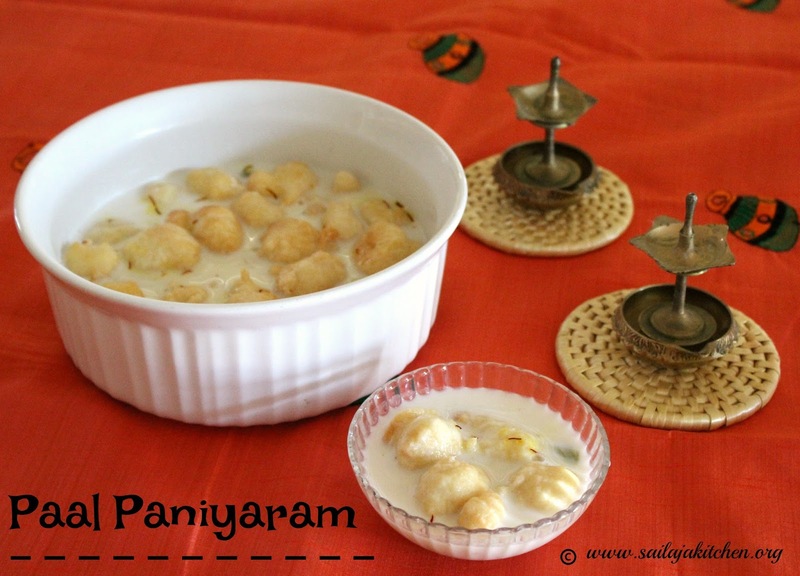 d) You can make this ahead and soak the paniyaram just before guest arrives to save time. e) If you have fried it crisp don't worry add the paniyarams to hot water for couple minutes.Then squeeze out the water and add to the milk (As we do it for dahi vada). f) My mom never used rice in this recipe just the urad dal batter. Take a bowl add all above ingredients together. Mix it well till it looks like bread crumbs. Now slowly add water little by little & form a tight dough. Cover & rest it for 10 minutes. Heat ghee in a pan add the almonds and fry till its light brown. Now add the coconut & fry till water has slightly evaporated. 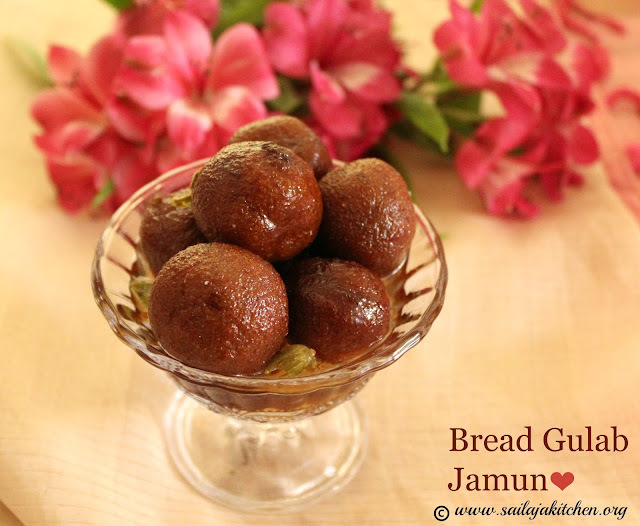 Add the khoya,jaggery,cardamom powder & raisins,fry in low flame till everything is well combined.Cool the mixture & divide into 11 equal size balls. Take a ball of outer covering roll it out into a thin disc.Place a ball of filling in the middle. 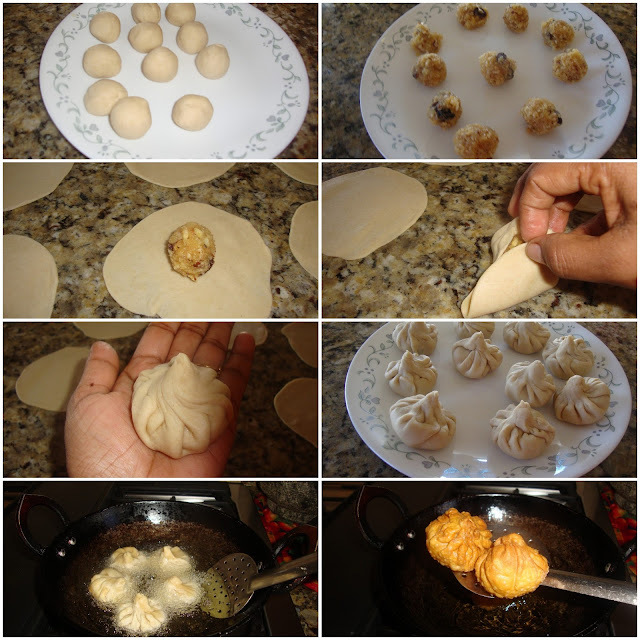 Pleat the dough and close the modak,twist on top to seal them well (see picture). Heat oil in a kadai and in medium high flame deep fry till crisp & brown on all sides. 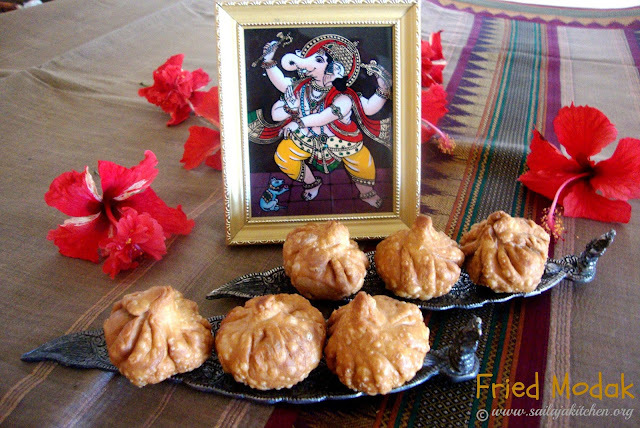 Cool & serve them to Lord Ganesha. 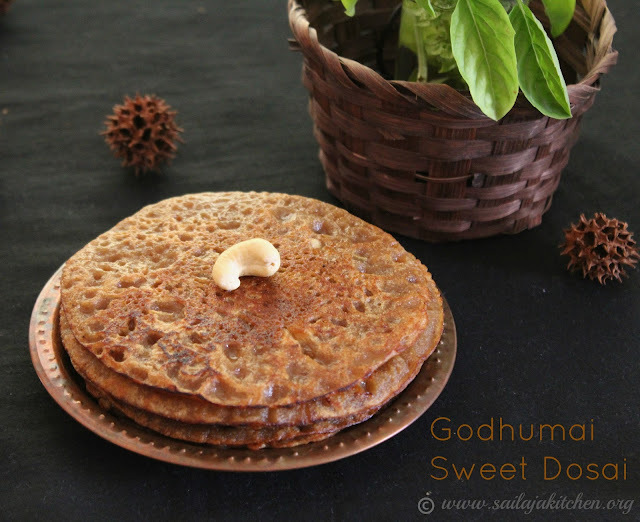 a)Sugar can be added instead of jaggery. b)If using sweetened khoya then add jaggery accordingly. c)Any nuts of your choice can be added in the filling. d)Seal properly otherwise your filling will come out. Add sugar & water in a non stick pan or kadai,give a boil. Reduce the flame and add the milk, when the mixture comes to a one string consistency add the paneer cubes & crushed cardamom. 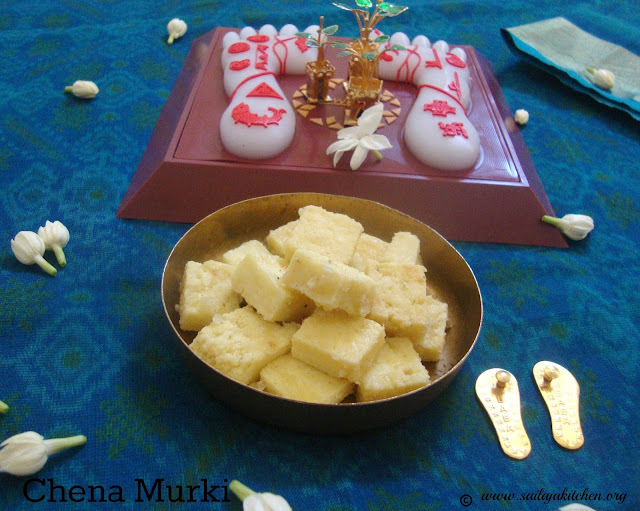 In low flame keep mixing gently till the paneer cubes are well coated with the sugar and dry. Add the essence and give a quick mix. Switch off the stove cool & serve. Remove the crust from the bread,crumble the bread slices. Sprinkle milk & make a soft dough.Make small balls slightly flatten the balls,place some filling & cover it well. Heat oil in a pan deep fry these balls in medium high flame till light brown on all sides. Prick the balls with a fork on all sides.Put the fried balls immediately into the hot syrup. Do not fry the balls till crisp,it will become hard. While adding the balls the syrup should be very hot. Prick the ball with a fork on all sides before adding it to the syrup. White bread can be used in this recipe instead of wheat bread.